Journey to Ireland with native Cathy French and Suzanne Dunning (who is Irish at heart). The retreat will be a week long and will be limited to 12 people. It will focus on dropping into complete presence and joy. There will be daily yoga, ample time for deep rest, exploration, plenty of music, delicious local food, as well as the opportunity to have Cathy and Suzanne guide you in deepening your yoga practice. Our home base will be at a retreat center in County Wicklow just an hour from Dublin. We will spend a few days settling there- hiking and exploring ancient ruins as well as simply relaxing. From there we will all journey to the West Coast of Ireland and explore ancient spiritual sites along the way. Cathy and Suzanne will guide you in yoga and meditation- with at least one practice session daily. Vinyasa flow, meditation, restorative yoga, and yoga nidra will all be included. This week of strong practice will leave you feeling more connected to your body than perhaps you ever have, as well as help you build the routine of yoga into your day. Seasonal, vegetarian food will be lovingly prepared by a local chef with plenty of time for sipping tea throughout the day. We will spend the week with local musicians, artists and an archeologist. There will be hiking, guided tours to ancient spiritual sites, traditional Irish pubs and music, as well as plenty of solo unwind time. Basically, it’s going to be pure magic. *There is a payment plan available of 4 equal payments if that is helpful for you. Airfare is not included- and ranges between $600-$1000 depending on when you book. We suggest that you arrive a few days early to adjust to jet lag. This will give you time to adjust. In this time you can explore Dublin and we will give you some suggestions of places to stay and things to do. From there you will take an hour bus to the retreat center in County Wicklow where we will meet you. 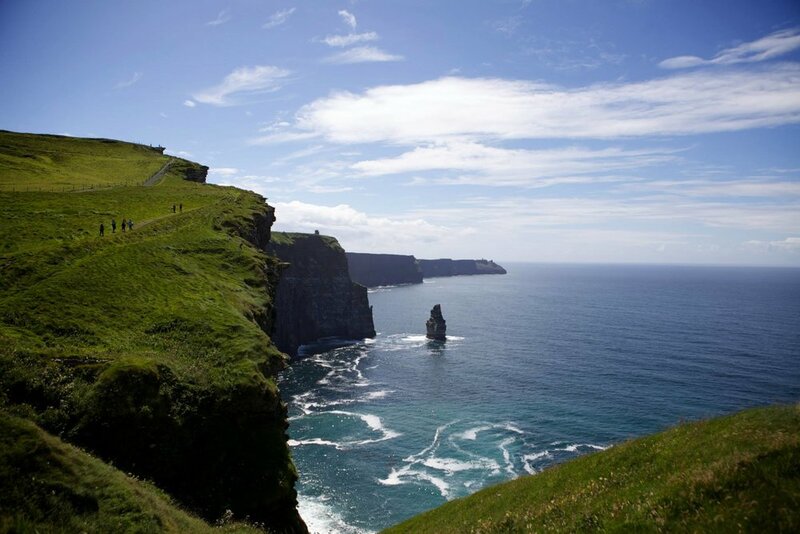 We also will give you suggestions of itineraries for exploring more of Ireland before or after the retreat. Suzanne first traveled to Ireland when she was 18 with only a vague sense that in its green wilds and tumultuous cliffs she might find meaning. When she traveled into the countryside she was met with a sense of belonging and calm expansive freedom she’d never found anywhere else. What she also found was good company nearly everywhere she went- a country filled with people who appreciated each other and the poetry that could be found in connection. During college she began traveling extensively and working as a writer and editor part-time for a Solo-Women’s Travel Magazine; she found that the more places she went the more that Ireland stood out. She’s gone back again and again, and it is only because of the amazingness of her family and community that the scales are tipped slightly in favor of Humboldt County. Cathy was born and raised on a farm in Co. Wexford on the south east coast of Ireland. She moved to Humboldt two years ago and has softened open into unspoiled scenery and this precious community. Besides connection to the land, family and friends what she misses most about Ireland is the generous humor of the Irish themselves. Warmth, music and banter are at the soul of what makes Ireland extraordinary. Having worked in hospitality and traveled extensively herself, Cathy is passionate about bringing visitors off the beaten track to experience Ireland’s raw beauty and ancient and emerging culture from the point of view of a proper local! Find out more about the yoga she offers on her website. If you’d like to join us please submit the form below. Space is limited and is filling quickly. Upon acceptance to the retreat there is a $500 non-refundable deposit due to hold your spot.